Come enjoy Pondering Pines Cabin in historic Twain Harte, California, only 2.5 hours from the Bay Area. 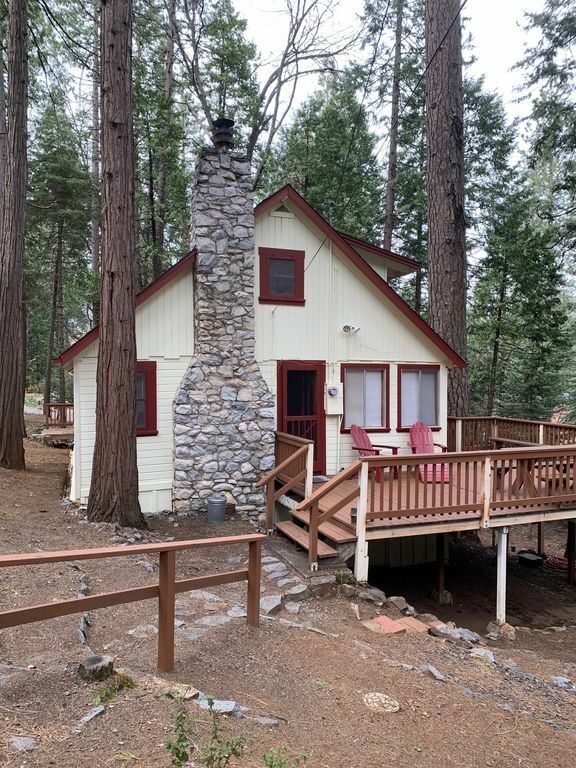 This peaceful redwood cabin shares the property with two giant Ponderosa Pine trees. We are located on one of the most beautiful and quiet streets in Twain Harte, just a few blocks away from downtown shops , pee wee golf and restaurants.We are the only vacation rental among our neighbors. The neighboring cabins are only used by the owners which keeps our area very quiet. Pondering Pines Cabin sleeps 8 with 2 bedrooms, a sleeping loft that serves as a third bedroom and two full bathrooms. The upstairs bedroom has a queen and a twin bed. The downstairs bedroom has a queen and twin bed also. The loft has two twins and one full bathroom upstairs and one downstairs as well. Many Californians know Twain Harte as an excellent vacation destination for families. Some of our renters are third generation Twain Harte vacationers! Pondering Pines Cabin also features lake membership. Great memories can be made spending sunny days on the beach at Twain Harte Lake. Twain Harte Lake is a large swimming lake with fishing, diving boards and water slides. There is a full snack bar that serves everything from burgers and fries to snow cones and ice cream! Winter days can be spent at Dodge Ridge Ski Resort just a ways up the highway. --Winter, Spring and Fall Rate is $175/night with a 2-night minimum or $950per week. --Holiday weekends have a 3-night minimum at 175/night. --Holiday weeks are $950/week or 175/night with a 3 night minimum. --Summer rentals by the week are $950/week or 175/night with a 3 night minimum. Check-in for weekly rental is 4 pm on Saturday and check-out is 11AM on the following Saturday. Summer rate is from Memorial Day Weekend to Labor Day Weekend. Pondering Pines thanks you! Summer reservations at this cabin go quickly! Hello to all new and returning renters of Pondering Pines Cabin ! We are the Colombo family ! Robert , Susan , Nicole , Tyler and Dominic Colombo. We are the new owners of the Pondering Pines Cabin! We live in Petaluma Ca. I've worked as a garbageman for the last 31 years in San Francisco and my wife is a stay at home mom. We look forward to your stay. We will try to make your visit a great experience !! My family has been vacationing in Twain Harte for about ten years now. We were looking for a vacation place that had everything. Twain Harte is that place. Twain Harte offers a beautiful swimming and fishing only lake, restaurants within walking distance, Pee Wee golf, hiking trails , golf course , movies in the park , only a few hours from the bay area , snow skiing and much more. Its been a long time dream of mine to own my own vacation place in the mountains. With the support of my wife we were able to make it work. Our cabin is located on a very quiet street yet its within walking distance to restaurants , pee wee golf and your morning coffee and fresh baked scone !!!. Its has a large deck and sits on about 1/4 of an acre.We spend every morning having coffee on the deck and every evening bbqing and enjoying our great view as the sun sets. We are very fortunate that all of our neighboring cabins are non vacation rentals. This keeps our area especially quiet. Deer can often be seen coming up from the creek down the hill behind the cabin.The creek is too far to hike to. Sorry kids :) On the nights we get back too late from the lake or playing in the snow we often walk to town for a bite at one of the local restaurants. 'The Rock' is very popular!The cabin was built in 1937 but has all the comforts of home. YES! It has central heat !!! We love Twain Harte and we love our cabin. I know you will too. Two full bathrooms. No bathtubs. Quiet street. Lots of space between neighboring cabins. Best of all......we are on a large lot (8,712sq ft)and behind our cabin are just two cabins (non rentals)on a private lane. Very Quiet. Bring your bath and beach towels. All bedding is supplied. Carport and driveway for 3 cars. Fully stocked. Dish towels too. No cable. DVD and VHS with a good supply of movies for kids and the older guests. Movie rental available at Twain Harte market. Small double speaker Iphone music player. Inside the livingroom table are VHS and DVD movies. Please dont let young children open the table. Quintessential Sierra Nevada cabin in a great location. we normally stay further up the hill towards Strawberry and Pinecrest but with so much snow we stayed lower down this year. Along with the great cabin (clean, warm, everything worked), there are several great options for eating out and also a really good supermarket in town - all close by. The cabins owner has it dialed in (communication and instructions) which made it really easy to show up and being enjoying our time in the mountains. Thank you Stefan! I'm so glad everything went well considering how much snow we had prior to your arrival.We do love the location of our cabin. Super quiet street but within walking distance to town.If you've never been to Twain Harte in the summer may I suggest giving it a try. We have private lake membership,peewee golf for the family and Bocce courts in town. Many great restaurants also. Nights on the back deck BBQing with a cocktail or glass of wine can't be beat! I offer 10% off a stay of 3 or more nights for return renters. Thanks again for choosing our cabin and following the check out directions to a tee. Our house cleaner gave you 2 thumbs up as renters! Its because of our great renters we have been able to keep up the cabin and make improvements as we go along. Thank you! Roberts home is exactly as advertised. It provided plenty of space for our, and one other, family (8 people total). On one rainy day the power went out on the block. Robert was quick to communicate to me and let me know when to expect the power to come back on in the house. The pre and post communication was also excellent. The lighting is a little tricky inside - the lights on the wall are the main ones you use when you enter. They are small and each need to be turned on by hand. They work fine once on, but there is not a standard light switch lighting up the house as you enter. I suggest bringing a flashlight to help you if you arrive at night. Thank you Robert for your kindness in opening your home for our family winter vacation. Thank you for taking the time to post a review and thank you for the very nice review also. We always have our house cleaner open up the cabin and get the water going and the heat. I should have told her to leave the lights on because of the later arrival. It's not very often our renters show up late in the evening. It's usually quite the opposite. Most ask for an early check in. HaHa! I've added a note to have the lights on for late arrivals. Hopefully you can return in the summer.I promise the lights will be on!! Winters are beautiful in Twain Harte but nothing beats summer at the private lake. I offer 10% off of 3 or more nights stay for return renters. Quiet, warm, and clean. The cabin was homey and well maintained. The owner was incredibly helpful with providing restaurant and activity suggestions. They were also quick to respond to any question that I had during my stay. Lots to do in the area and we were never bored! Can't wait to come back with the family again! Walking distance to town, but tucked away in a quiet neighborhood among the trees. Comfortable beds, a cozy fireplace, and deer to watch out the window. Robert was very helpful and easy to get ahold of when we had questions. A great place to stay in a wonderful little town. Thank you Kelly so much for the very nice review! We really love our location for the exact reasons you listed. Our house cleaner gave a 2 thumbs up to you and your family as renters. We greatly rely on renters like yourself to keep our cabin going. We hope you will return. You would LOVE Twain Harte in the summer. Especially the private lake. I do offer a 10% discount for return renters for 3 or more nights. Thanks again for choosing our cabin! Thank you very much Mr Wilson! I appreciate you taking the time to write us a review! As with all our guests I’m offering you 10% off your next visit of 2 days or more.We feel so very fortunate to be on such a quiet street with no other vacation rentals near us yet we can easily walk to town! We had a great stay. Clean and comfortable. We really enjoyed being able to walk downtown. Thank you Tiffany for the nice review! Yes! Being able to walk to town from our cabin is a huge plus! Yet we are far enough that we don't have the town noise or traffic on our street. It's really a great spot. Just a reminder of the  discount for return renters.We hope you will return. Thanks again! Holiday,Summer and Winter Rates are 175$ per night and 950$ per week with a 2 night minimum and 3 night minimum stay on holiday weeks and 3 day holiday weekends. Book a return stay and receive 10% off 3 or more nights.